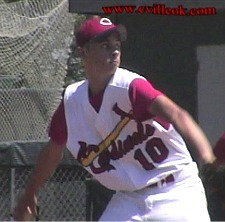 Chris Treibt pitched the first 4 innings against Okmulgee and gave up only 3 runs while the Cards offense gave him 13 runs and the win. Chad Ausmus gets a good look at this 2-run homer in the 2nd inning. Chris Treibt had a 3-run homer in the 4th. 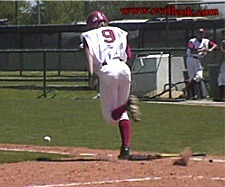 Ricky Rimpley races his bunt to first base. The catcher's throw to 1st hit Ricky and he advanced to second in the 2nd inning. 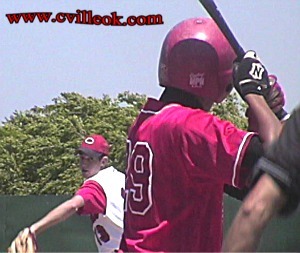 Collinsville scored 7 runs in that inning. 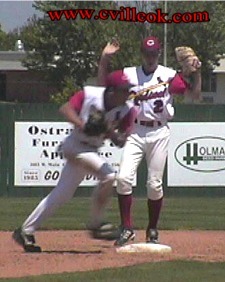 While Cory Flynn makes room, Jesse Bugg starts the front end of a double play attempt. Jimmy West started the 5th and final inning and preserved the 13-3 lead. Friday at 4pm, Collinsville will play the winner of Thursday's Berryhill -vs- Miami game => Berryhill. 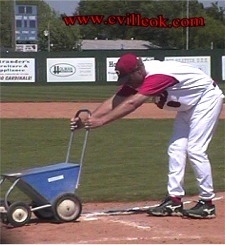 Following Collinsville's opening game victory the coaches and players got the field ready for 2 more games Thursday as they host the Regional tournament here. 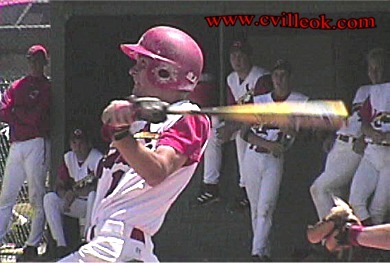 Coach Phil Davis lines the batters box above.